Donna has worked at Samford University since 1988. She has been in the office of university advancement since 2000, when she was hired as the campus’ first official web designer. 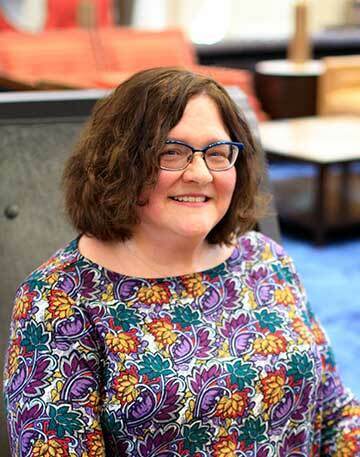 She came to the division from the Samford University Library, where she held various positions for 12 years, including catalog librarian, reference unit coordinator and bibliographic instruction librarian. Donna served on the web team there and helped create one of the university’s first websites, library.samford.edu, in 1994. She is a past president of the Alabama Library Association. A member of the original pilot group that taught in the Cornerstone curriculum, Donna also taught web design for several semesters as an adjunct professor in the Department of Journalism and Mass Communication. Donna is a member of Crosscreek Baptist Church, where she sings in the choir. She is the author of two independently published novels, Second Death and The Source of Lightning, as well as the editor of A Thematic Catalogue of the Musical Works of Johann Pachelbel, written by her late stepfather Jean M. Perreault and published by Scarecrow Press. "Turning the Library Upside Down: Reorganization Using Total Quality Management Principles," co-written with Jean Thomason and Elizabeth Crabtree Wells, Journal of Academic Librarianship vol. 19, no 5 (November 1993): 294-299.